Fairfield, CT - First Selectman Mike Tetreau, the Sustainable Fairfield Task Force (SFTF) and Mill River Wetland Committee (MRWC) announced today that Fairfield residents can join fellow Americans in communities throughout the nation to make a long-term commitment to wiser use of our water and energy resources by taking part in the annual Wyland Foundation's National Mayor’s Challenge for Water Conservation. The annual challenge, April 1-30, is a non-profit national community service campaign to inspire individuals to make a series of informative and easy-to-do online pledges at www.mywaterpledge.com to use water more efficiently, reduce pollution, and save energy. Illustrating this risk, Aquarion Water Company declared in 2016 a drought-related water emergency and temporarily banned all outdoor water use in Darien, Greenwich, New Canaan and Stamford. Outdoor irrigation limits were also later imposed in Newtown and Westport. Since outdoor water use accounts for about 30% of average suburban household consumption, every community can expect future, similar restrictions unless water use decreases. Beginning April 1, Fairfield residents can participate in this Challenge by visiting www.mywaterpledge.com and make online pledges to conserve water on Fairfield’s behalf. Nationwide, communities will compete within specific population categories to build participation by their residents. In each category, communities with the highest percentage of residents participating will be entered into drawings for eco-friendly prizes, including home improvement gift cards, home irrigation equipment, and a $3,000 Home Utility Bill Payment. The Challenge also lets residents nominate a worthy local charity to receive a 2019 Toyota Highlander Hybrid. At www.mywaterpledge.com, the Challenge offers information for residents on sustaining their conservation commitment, covering regional water and energy resource issues and cost-saving tips at home. Residents also can learn more about reducing household and outdoor water use at a presentation on “Using Water Wisely” by Twig Holland, Aquarion Water Company’s Program Coordinator, on April 8 at 7 p.m. at the Fairfield Museum and History Center, 370 Beach Road. The Challenge goes beyond recent drought issues and looks at the ways our water use will affect the future of our communities — from how we grow food to reducing polluted runoff. Last year, residents of more than 3,800 communities in all 50 U.S. states pledged to reduce their annual freshwater consumption by 3 billion gallons, reduce waste sent to landfills by 79.9 million pounds, and prevent more than 177,000 pounds of hazardous waste from entering watersheds. Local organizations leading Fairfield’s participation in the Challenge are, on behalf of the Town, the SFTF and, on behalf of the community, MRWC. The SFTF provides support for Town practices and projects that can help Fairfield manage its growth to safeguard the health of its environment, ensure the reliability and economical use of its natural resources, and preserve the quality of life of its residents – today and for the future. MRWC educates the community about the value of wetlands, to advocate for their continued protection and to engage all people in the fight to protect our environment. For over 50 years, MRWC’s River-Lab Program has taught generations of students and parents to value the watersheds that support our lives. The 8th National Mayor’s Challenge for Water Conservation is presented by the Wyland Foundation and Toyota, with support from the U.S EPA WaterSense, The Toro Company, National League of Cities, Conserva Irrigation, and Earth Friendly Products (makers of ECOS). 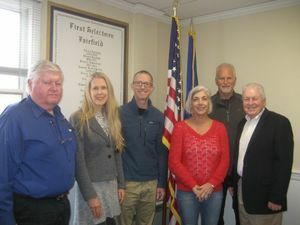 The photo shows (l:r) Fairfield Assistant Director of Public Works Ed Boman, SFTF Member Daphne Dixon, SFTF Chair Scott Thompson, SFTF Members Mary Hogue and Bob Wall and First Selectman Mike Tetreau.